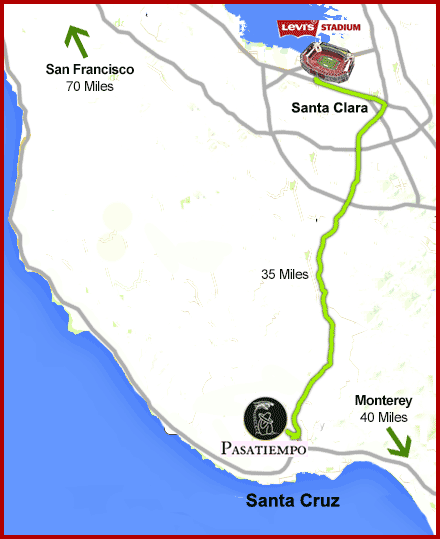 The Golden Anniversary Super Bowl 50 descended on the Bay Area Super Bowl L (50) descended on Santa Clara and the South Bay on February 7th, 2016, at the new home of the San Francisco 49er's, Levi's Stadium. As an avid golfer, while in the San Jose, and/or Silicon Valley area, Pasatiempo Golf Club is a must play Alister MacKenzie masterpiece located in Santa Cruz. We are one of the finest golf courses in all of California, ranked #2 only behind Pebble Beach. Pasatiempo was Alister's favorite layout and where he made his American home, which still borders the sixth fairway. The historic Pasatiempo Golf Club is a golfer's dream come true - it is currently ranked #13 in Golf Magazine’s Top 100 Courses You Can Play 2012 and ranked #24 in Golf Digest’s 2013-14 America’s Greatest Public Courses. Golf Digest also named Pasatiempo Golf Club one of the top 2 courses you can play in California, only behind Pebble Beach . Located a short 35 miles south of Levi's Stadium just off the scenic Highway 17 toward Santa Cruz, sits one of the iconic golf courses in all of California, Pasatiempo Golf Club. When searching for Golf Courses near Levi's stadium, you realize there is nothing that comes close to this masterpiece. Come stand on our first tee and look over the Giant Dipper roller coaster at the boardwalk and straight into the Pacific Ocean. Santa Cruz California is where millions of tourists come annually to go the beach. During the regular season many visitors flock to the San Francisco Bay Area to see their favorite team compete against our beloved 49er's, which now play their home games in Santa Clara. and... many take a few days before or after the game to enjoy the bay area, and of course play a round of golf or two. With the World renowned Pasatiempo Golf Club a 30 to 40 minute drive from Santa Clara, and less than 30 minutes from San Jose, it would be an easy "Bucket List" course for the avid golfer to play. Stay tuned for the 49er home game schedule once available from the NFL.